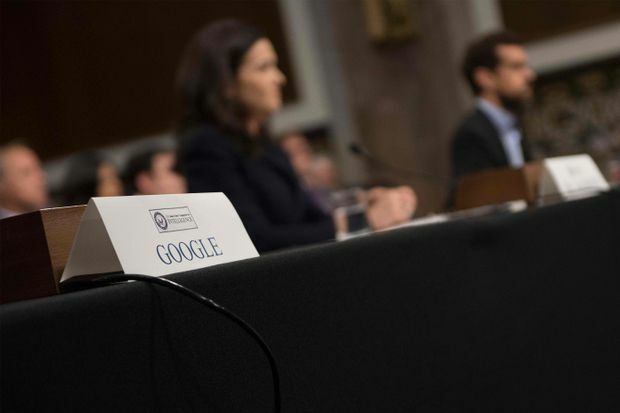 The seat for Alphabet CEO Larry Page sits empty as Twitter CEO Jack Dorsey, right, and Facebook COO Sheryl Sandberg, centre, testify before the U.S. Senate in Washington, D.C., on Sept. 5, 2018. Six major Web companies and internet-service providers, including AT&T Inc, Twitter Inc and Alphabet Inc’s Google, will detail their consumer data privacy practices to a U.S. Senate panel on Sept. 26, according to a congressional statement on Wednesday. The European Union General Data Protection Regulation took effect in May, replacing the bloc’s patchwork of rules dating back to 1995. Breaking privacy laws can result in fines of up to 4 per cent of global revenue or 20 million euros ($23.2 million), whichever is higher, as opposed to a few hundred thousand euros.